I first learned about meditation and mindfulness in college and while it sounded interesting I didn’t formally engage in a meditation practice for another 20 years. But in hindsight I now realize I very much became a practitioner of being in the moment and mindfulness when I took up daily bicycle riding, years before I ever sat and watched my breath. From my first 10 mile bike ride I fell in love with the freedom and exhilaration one experiences while riding long distances up and down the hills of Vermont and New Hampshire. For nearly 15 years I turned the pedals on my bike round and round from March through mid November. At times my riding included others, but often I’d ride alone. My daily ride distance stretched from 20 to 50 miles in what I now recognize as me Bicycling into Mindfulness. While pedaling, my thoughts would become nonexistent, they’d fall away or disappear as each foot locked to the pedals went round and round. 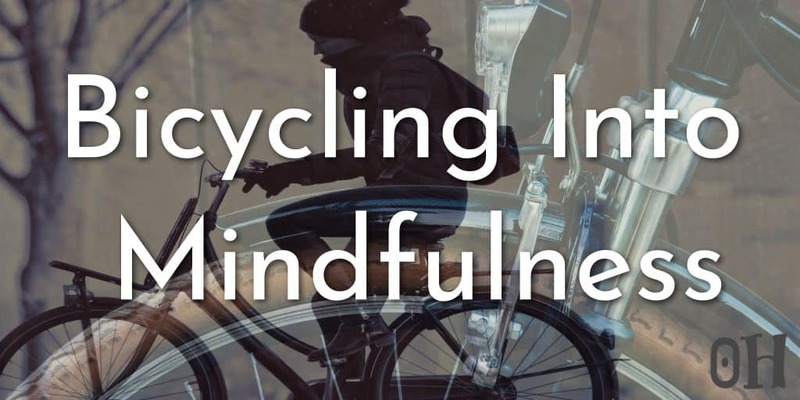 The pedaling itself became my focus and in time the cadence anchored my chattering mind and delivered a panorama of visual clarity and effortless purpose, I’d discovered Bicycling into Mindfulness. Many occupations such as surgeons, pilots, writers, athletes and welders often find themselves completely in the moment while the rest of the world vanishes. This falling away of thought transforms into mindfulness and present moment awareness, a state most of us can tap into using a simple meditation practice. For Beginners I recommend the MUSE headband as a wonderful tool to quiet your thinking and develop everyday mindful awareness. Our minds ride upon a torrent of thoughts from the moment we wake each morning till we finally fall asleep each evening. On average each of us produces 60,000 distinct thoughts each and every day, thankfully most of those thoughts are below the surface awareness, otherwise we’d become immobile. I stopped riding regularly when I moved to an urban area and grew tired of fighting the traffic and potholes I came across as I searched for a clear stretch of road, and I’m not mentioning the all too common flat tires that frequently occurred. One of my favorite rides took place in a small Vermont town known at Quechee. Originally a farming community that turned into a resort and 2nd home community for those who the locals called Flatlanders, meaning they moved to Vermont from Connecticut or Massachusetts. In Quechee I’d park my car at a friends house on Main Street and begin my ride. Main Street is a narrow two lane road bereft of shoulders, meaning if I got too close to the edge of the road I’d tumble down an embankment. The tumbling was always in the back of my mind as I pedaled forward along Main Street, and yes I did tumble down the embankments a few times. The aforementioned tumbling caused me to ride in the middle of the lane while on Main St, thus forcing cars coming up behind me to go around me and saving me from more tumbles off the edge of the road. Paying attention to each moment was vital for the first few miles of my ride. Main Street merged with Route 4 in the small town of Taftsville, but first I had to cross the one lane covered wooden bridge. Crossing meant riding in the center of the bridge on a raised series of boards no more than 18 inches wide. I’d zoom over the bridge as fast as possible, hoping a car coming the opposite direction didn’t appear and force me to stop and let the car pass then start riding on the middle planks to finish the river crossing. Cars rarely waited for me to finish my crossing before proceeding their crossing. Once on Route 4, I was able to focus on my pedaling to maximize both my speed and efficiency. To get the most out of riding it’s important to master the cadence of pedaling much like mastering the cadence of breathing when sitting in a regular or device aided meditation session. Our tendency is to point our toes toward the ground on each down-stroke, but it turns out that keeping our foot and the pedal flat on the down-stroke if more efficient. And it allows more speed with less effort over time. Keep both feet parallel to the ground through the entire pedaling cycle. As your foot reaches the point where it starts it’s upward motion, lift that foot using your leg and the momentum of the pedal. Continue lifting on each rotation while keeping both feet parallel to the ground. Down-Push and Up-Pull in a fluid oval motion. Much like watching your breath in sitting meditation this way of pedaling will feel awkward at first and you may find yourself becoming mechanical as your apply the practice. Just as in breathing during meditation it’s important to let the body find its own rhythm and not get attached to perfection. Let your breathing and your pedaling take on their own cadence.. Left alone your body will breath in and out on it’s own, and your feet will go round and round on their own as well. If you find yourself rocking from side to side your seat needs to be lowered some. If you find yourself squirming in your chair as you do meditation remind yourself that it’s just resistance to sitting quietly expressing itself. Resistance to a quiet mind or a smoothly flowing pedaling motion is natural. Our mind is busy and will always look for an outlet until we train it to slow itself and connect it to awareness of breath and awareness of pedaling. In the center of Woodstock I’d turn right onto Route 12 and head north out of town. It was on Route 12 that I found my cadence, a cadence resembling settling into the natural rhythm of breathing during my daily 40 minute MUSE mindfulness sessions. it was on Route 12 that I first experienced Bicycling into Mindfulness. My bike route took me past Mt. Tom and the cut off to Suicide 6, both were ski areas where I spent countless hours in my early teens. Mt. Tom is now closed for skiing but is crisscrossed with hiking trails. Each time I’d pass the ski areas memories would fill my mind and occasionally throw off my pedaling cadence. The push and lift, push and lift would decay as my mind wandered to skiing down the mountains on some bright sunny day full of joy, full of youth. But just as I bring my awareness back to the in and out of my breathing while sitting in meditation I’d bring my pedaling back to the familiar push and lift, push and lift cadence. After the passing the ski areas the road took on a steady rise broken up by a few downhill dips and then upward again it went. The steady assent was one of the joys of riding and I’d easily slip into a no thinking mode of awareness as I pedaled (push and lift) upwards for miles and miles. Once I reached my turn around point I’d spin around and speed as fast as possible back down toward town. The downhill part of the ride was glorious and while I didn’t need to pedal for much of it I nevertheless continued my cadence all the while watching the world pass by in a blur of focused awareness while bicycling into mindfulness. Push and Lift, Push and Lift, In and Out, In and Out. The pedaling and breathing anchoring my mind in a serenity where the stream of thoughts, judgments and assumptions melted away. it’s all the same thing. Very interesting article Craig. Mindfullness is a valuable tool, but can be a challenge to work in to daily life at times. I like the perspective on making it a part of other important things such as exercise. Thanks for the insight.